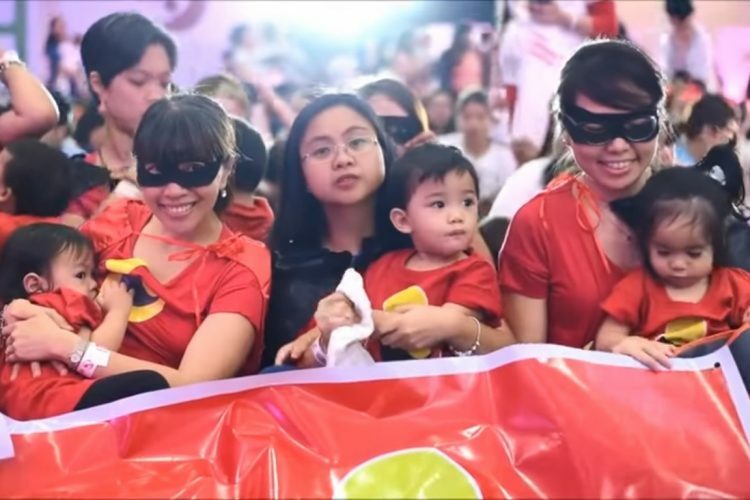 A stadium in Manila was completely filled with hundreds of mothers on Sunday, August 5. They all were simultaneously breastfeeding their babies while listening to dance music. Aimed at combating child deaths, the mass breastfeeding event backed by the Philippines government saw the participation of over 1,500 mothers to celebrate the World Breastfeeding Week. The annual event aims to draw public support for a government campaign to get more mothers to switch to breast milk from infant formula. Some of the mothers adorned tiaras while others wore superhero costumes to the event. Many of them expressed that the event was “empowering”. The Philippines hosted 61 other mass breastfeeding events across many cities over the weekend. According to Rose Padua, the organiser of the events, said that the country was on course to beat last year’s attendance of 4,775 nursing mothers in 25 events. As per the World Health Organization (WHO) and United Nations Children’s Fund (UNICEF), newborn babies should be given breast milk within the first hour of birth and should be exclusively breastfed for the first six months. According to WHO, 27 out of every 1000 children born in the Philippines die before reaching the age of five. Globally, 60% of the babies who are not breastfed early, are at a higher risk of death and disease.